After missing the playoffs for the fourth year in a row, changes were needed in the Giants organization. First the Giants and head coach Tom Coughlin parted ways after 12 seasons and two Super Bowls. The decision to part ways was a difficult one given all that Coughlin has meant to the franchise. He amassed a record of 102-90 in the regular season and 8-3 in the postseason. He also had a tremendous bond with his players especially quarterback Eli Manning. With Coughlin gone it was imperative that the Giants try to keep as much continuity as possible. So they promoted offensive coordinator Ben McAdoo has their new head coach, and kept defensive coordinator Steve Spagnuolo. With the coaching staff in place, general manager Jerry Reese turned his attention to upgrading the roster in particular the defense. Last season the Giants defense was historically bad given up 442 points, and gave up an NFL worse 420 yards per game. Their once fierce pass rush was nonexistent as they registered a mere 23 sacks which was 30th in the NFL. To fix the defense Reese spent a fortune in the offseason acquiring free agents to bolster the Giants defense. The Giants biggest free agent signing was former Dolphins defensive end Olivier Vernon whom the Giants signed to a five year 85 million dollar contract, making him one of the highest paid defensive players in the league. In his four seasons with the Dolphins, Vernon had 29 sacks and 196 tackles. With Vernon playing on the opposite side to Jason Pierre-Paul, the Giants will have to edge pass rushers that will be able to provide consistent pressure to opposing quarterbacks. Reese then turned his attention to the secondary and signed cornerback Janoris Jenkins. Jenkins spent his first four seasons with the Rams where he had 10 interceptions, and scored five touchdowns. Jenkins is an aggressive and physical corner that the Giants desperately needed to defend the likes of Dez Bryant, and DeSean Jackson. Arguably the best acquisition that Giants made this year was signing defensive tackle Damon Harrison. Harrison is one of the best tackles against the run, and was one of the reasons why when he was with the Jets last year, they gave up the second fewest rushing yards in the league. With Johnathan Hankins returning from injury, he and Harrison will give the Giants one of the best tackle tandems in the league and will surely improve from the 24th ranked defense from a season ago. The Giants not only upgraded their defense through free agency, but they also drafted three defensive players in this year’s draft. With their first round pick, the Giants selected cornerback Eli Apple from Ohio State. Apple will compete with Tevin Wade to see who will be the Giants nickel back. In the third round the Giants selected Darian Thompson from Boise State. Thompson has great balls skills and recorded 19 interceptions in college. Expect him to compete for the starting free safety positon. In the fourth round the Giants took linebacker B.J Goodson from Clemson. Goodson is a hard hitting athletic linebacker that will contribute on special teams and possibly starting at one of the linebacker positions. With the defense now having the potential of being a top 10 defense, the Giants offense will also be better due to their second round draft pick wide receiver Sterling Shepard. Shepard is a quick receiver with excellent hands. 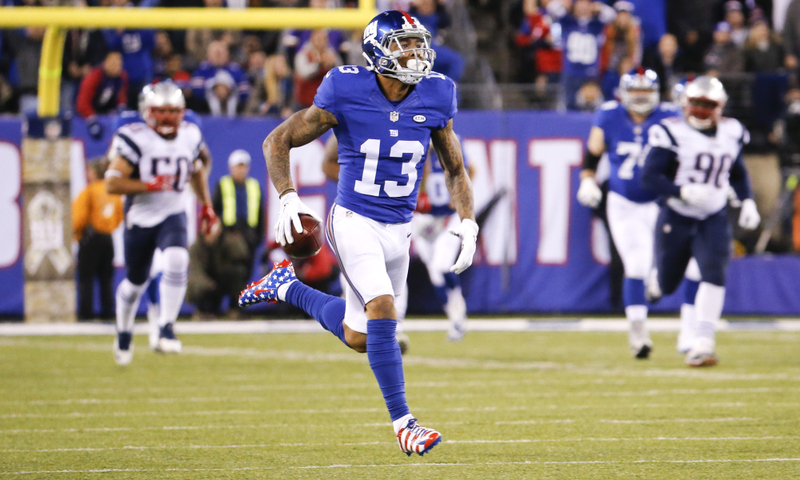 In fact some of the Giants coaches believe his hands are as good as Odell Beckham Jr. He will provide Eli Manning with a second reliable receiving option to go along with Beckham Jr. With Beckham Jr, Shepard, and hopefully he healthy Victor Cruz, the Giants will have an explosive offense that could shatter team records. It’s without a shadow of a doubt the 2016 New York Giants are a better and more complete team than the Giants teams of the past few seasons. They are reloaded and poised to make it back to the playoffs for the first time since winning Super Bowl XLVI.